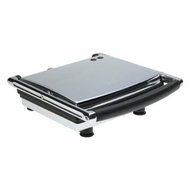 Grill and cook many types of foods: sandwiches, hamburgers, chicken, fish and steaks. Non-stick cooking plates for easy cleaning. Floating hinge system adjusts automatically to accommodate different food thickness. Cool-touched thermo-insulated handle provides comfort and safety. Indicator lights: red light indicates power, green light illuminates when initial cooking temperature is reached. Vertical storage and hidden cord storage.